Hello Dear Reader- When I went vegan a few years back, I didn’t expect that I’d continue to enjoy pizza. After all, I grew up in, what some would call, the pizza capital of the US…New Haven, Ct. I’d never had a pizza without cheese and I couldn’t imagine it would be trying. I was quickly proven wrong. I’ve had some great vegan pizzas at Flatbread in Waitsfield, Vermont where richly flavored, farm fresh local vegetables take center stage on top of the pie. And the pizza at Matthew Kenney’s vegan restaurant, Double Zero, in NYC, is out-of-this-world. It’s become a favorite of all the members of my family: vegans, pescatarians and omnivores alike. Finally, there’s Miyoko’s Kitchen nut-based Mozzarella cheese. Miyoko is a kitchen wizard. Her cheese is divine and is wonderful atop many things including pizza. 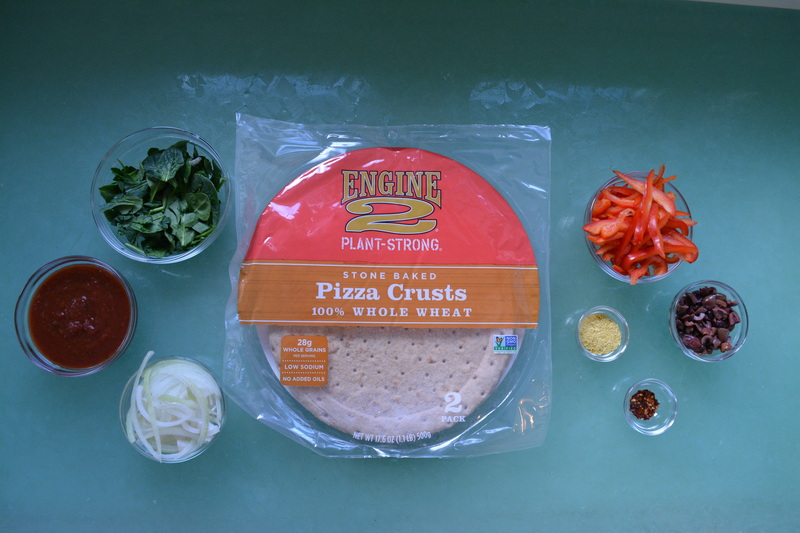 I never thought to bother making vegan pizza at home until I discovered Rip’s Plant-strong Engine 2 Whole Wheat Pizza Crusts at my local Whole Foods. They are so tasty and healthy. Very low in fat with no added oils and minimal processing, they are one of a variety of items offered by Rip Esselstyn’s line of plant-based convenience foods. Once I got a tip from my teaching partner, Annie, I was on my way. She suggested topping a pizza with olives to add some saltiness and fat (the healthy kind) to stand in for cheese. Great suggestion! Olives are rich in umami too. I agree with Annie, olives really transform a vegan pizza. 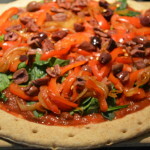 My husband and I love the Tuscan Pizza recipe I created using my Heathy Vegan Made Easy 5-step system. This is the system I use to create health-promoting, easy-to-prepare and delicious recipes. In the case of the pizza, these are my steps. Step 1: Marina Sauce, Step 2: Spinach, Onions and Peppers, Step 3: Engine 2 Whole Wheat Pizza Crust, Step 4: Olives Step 5: Chili Flakes and Nutritional Yeast. Here are the ingredients for the pizza prepped any ready to go. I created a video to show you how to make the pizza. 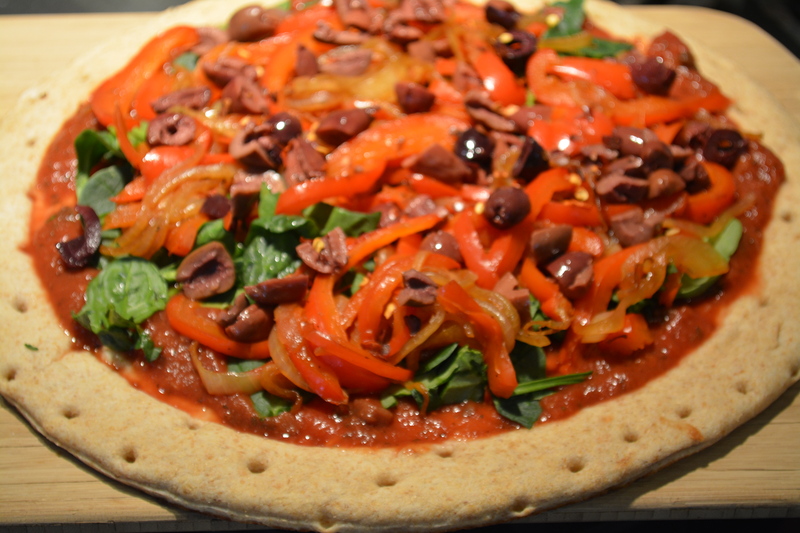 I give a tip for caramelizing onions without any oil and I also do a nutritional comparison between this plant-based Tuscan Pizza and a typical Cheese Pizza. Here is the recipe for the pizza. I hope you enjoy it as much as we do! Heat a large sauce pan over medium high heat. Add two tablespoons of water and then the onions and peppers. Saute for 10-12 minutes until softened adding more water 2 tbs at a time, if necessary. Spread the tomato sauce evenly on the pizza crust. Layer with spinach and then the onions and pepper mixture. Distribute the olives evenly over the top. Bake for 8-10 minutes until crust begins to brown. Sprinkle with red pepper flakes and nutritional yeast to taste. Made this tonight – yum! Made the above and one with mushroom/zucchini and arugula. What do you use for marinara – do you make your own? Hi Alan- Thanks for your feedback!! I like the Trader Joe’s no oil Mushroom Marinara. Dinny had a good idea to use tomato paste. That would work well and solve the runniness problem that can be caused by a particularly thin/liquidy marinara.